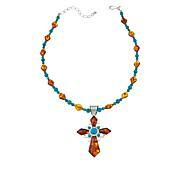 Andean Blue turquoise from Chile gets the star treatment in this pendant and necklace combination from Jay King. 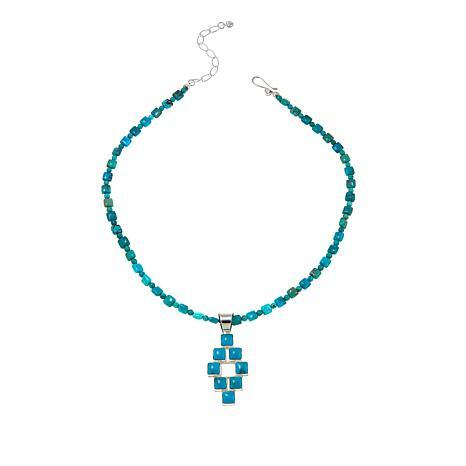 The sterling silver pendant features a geometric arrangement of turquoise squares, while the beaded necklace boasts a unique profile that's thinner in the middle and thicker towards the ends. 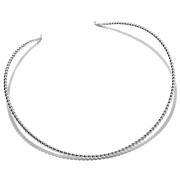 Wear the pieces together or separately for a variety of fun, fashionable looks! 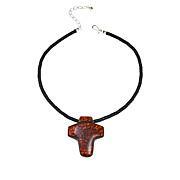 I had wanted this Andean necklace to match up with another JK Andean necklace. Wow, I was surprised that this necklace is so much prettier in person. It is much smaller than what Jay usually designs, but it is definitely a keeper! 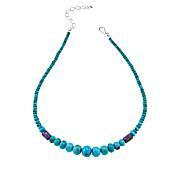 Enjoy a showcase of turquoise. Brown beads from the Far East mingle with mixed browns and blues from Nevada's old Number Eight mine to deliver this gallery of gemology. A distinctive display of the ever-popular stone, Jay's mix-and-matchable pendant and necklace promises to please turquoise fans.